Microsoft is a massive company and with the reach it can give your organisation, there are so many advantages of being a Dynamics partner. You get access to a great deal of useful information which can be an enormous advantage but it can easily turn into a disadvantage if you don’t know where to find it! The problem is that Microsoft have a number of websites and tools and both new and existing partners sometimes struggle to find what they need. This is the generic partner network site where you can manage your partner accreditation; it has a Dynamics section with some useful info for new partners: benefits, accreditation info, guides, links to training and tools to help partners demo and sell CRM or ERP. Pros – easy to access Cons – has limited Dynamics info. One of the most popular portals that holds a lot of info about product updates, licensing, pricing, demos, sales materials, guides, training materials, events, etc..
Pros – you are most likely to find what you are after here Cons – there is just too much info, some of it can be out of date, and it’s hard to navigate; if you get referred to it, always make sure you ask for the exact link to the document you are after. This one is key as it gives partners access to their clients’ licensing data, CSA commission payments, staff and accreditation management. Pros – excellent tool as it can tell you all about number of users, administrators, license renewal dates, etc. You need to make sure you are the Partner of record to access this info. Cons – sometimes it takes a long time to associate your clients to your organisational accounts. Similar to Voice but it covers Volume Licensing and all Microsoft products; all the large deals that Microsoft work on are normally enterprise agreements and are unlikely to be listed in Voice unless you know the enrolment number of the customer. You can obtain it from ExploreMS as well as all the details about the licenses. Pros – very insightful if you know what you are looking for Cons – designed for people who understand volume licensing so it would be nearly impossible to know what you are looking for without this knowledge. Great tool if you are looking for another Dynamics partner in a different territory. This is what some customers will use to find a local partner so it’s important you list your company here. Pros – nice map view Cons – not everyone is registered so you’ll probably have a limited view. Basically very similar to Market Place but is not Dynamics specific – it covers all Microsoft technologies. You can find companies by location, competency, industry focus, etc.. More and more end-users are starting to use this tool. Pros – easy to find info; do register as it gets 45,000 visits per month so a great promotional tool. Cons – same as above, not everyone is registered so make sure your company is listed there. Check with your local Microsoft representatives if they have a local partner network. You get access to many other partners (including your competitors), you can share ideas, concerns, communicate to Microsoft directly as they are very proactive on it. Pros – it is like a corporate Facebook so there are lots of benefits of joining Cons – not very easy to find out which network you can join and whom to ask to invite you. There are so many LinkedIn Groups. 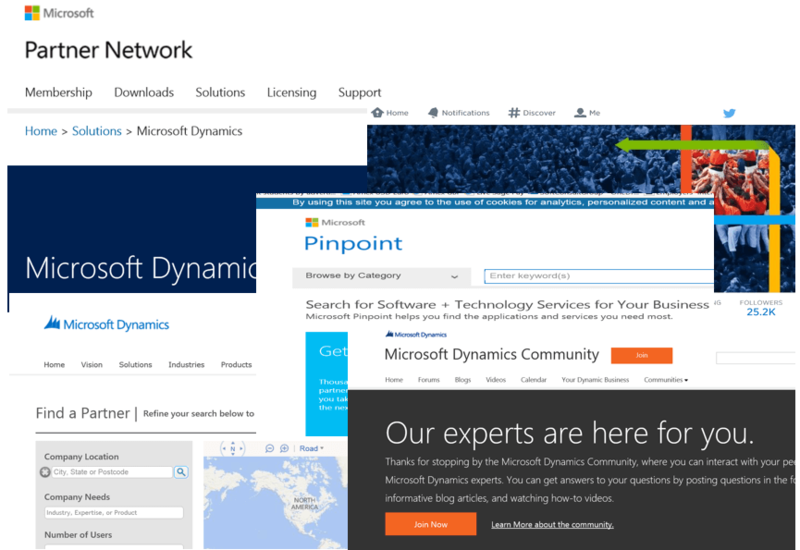 Here are some suggestions but there are many many more: Microsoft Dynamics Partner Community, Microsoft Dynamics Community, Microsoft Dynamics ERP- #1 group for AX, NAV, CRM, GP, SL, RMS & MS SharePoint, Microsoft Dynamics CRM, Microsoft Dynamics AX Forum, MS Dynamics (3000+), etc..
Pros – you can ask questions in the forum, find out about events, new releases, get in touch with other partners, etc.. Cons – your inbox will fill in with lots more emails with updates. Pros – you get the latest info Cons – if you are not a Twitter user yet it might get some time to get used to it. Quite a lot of sites, I know… and I am sure I’ve missed some out. So if you know of any others, do share them so we can update this list and help everyone. Watch this space for a similar update on sites for Dynamics end-users and freelancers.